As periodontitis is a complex inflammatory disease exploring its various facets through a myriad of diagnostic procedures, it poses an intriguing challenge to periodontists and clinical researchers. The current age of molecular medicine has ushered the need to quantify the disease markers to study the due course of disease progression. This, in turn, has marked the dawn of a tumultuous journey to study various diseases in the oral cavity using serum, saliva, gingival crevicular fluid, tissue samples, etc. Three such novel biomolecules which have been investigated in the recent past in periodontal disease were trefoil factors. The mammalian Trefoil Factor (TFF) contains three members–TFF1, TFF2, and TFF3.,, Trefoil factors (TFFs) are short peptides with invariant cysteine residues that form disulfide bonds producing a trefoil domain secreted by mucin-producing epithelial cells of the gastrointestinal tract  and other tissues such as serum,, cervical, salivary glands,,, and oral mucosa (OM) which are cosecreted along with mucins binding to epithelial cells and aiding in their protective functions. Saliva as a mirror of oral and systemic health which is a valuable source for clinically relevant information because it contains biomarkers specific for the unique physiological aspects of periodontal disease. TFF3 secretion through salivary gland tissues has been well documented by the previous studies. Even though gingival crevicular fluid can be analyzed for TFF3 levels as its collection and subsequent analysis is majorly limited by extremely small amounts besides requiring the special equipment for collection, saliva was preferred over GCF for the determination of TFF3 in chronic gingivitis and periodontitis patients, as it also has a significant role in the pathogenesis and progression of periodontal disease. More so, its collection is also noninvasive and is also under the control of the clinician. However, till date, there is only one published work on the role of salivary TFF3 in periodontal disease. Hence the present study aimed to unravel the enigma behind the role of this multifaceted molecule in patients with gingivitis and periodontitis. During the time period of August 2014 to March 2015, fifty systemically healthy individuals who included 25 chronic gingivitis (12 males and 13 females, mean age: 35.7 ± 5.96 years) and 25 chronic periodontitis patients (18 males and 7 females, mean age: 30.84 ± 9.95 years) participated in the present study. Diagnosis of periodontal diseases was based on the 1999 International Workshop for Classification of Periodontal Diseases and Conditions. This research project was approved by the Institutional Ethics Committee, Vishnu Dental College. (IEC–VDC/RP 2012-75). The participants were selected from those attending the Department of Periodontics and Implantology, Vishnu Dental College, Bhimavaram. The purpose and type of procedures involved in the study protocol were explained to all the participants, and written consent was obtained. The periodontal examination was performed at baseline and at 6 weeks recall following nonsurgical periodontal therapy (NSPT) which included the assessment of: (1) detailed medical and dental history, (2) plaque index (PI), (3) gingival index (GI), (4) probing pocket depth, and (5) clinical attachment level (CAL). (a) Participants with chronic periodontitis with a minimum of twenty remaining teeth in the dentition showing CAL of ≥4 mm in at least 6 teeth of dentition, confirmed by the radiographic evidence of bone loss. (b) Patients who had not received periodontal treatment in the past 1 year. Gingivitis patients with clinically normal tissues as evidenced by lack of bleeding upon probing, uniformed probing depth (PD) of 3 mm or below, and with no evidence of attachment loss. (a) Pregnant and lactating woman, (b) Patients with systemic diseases such as hypertension, diabetes mellitus, and salivary gland diseases. (c) Patients who are on medications and substances that will enhance salivary flow, and (d) Patients who have used antibiotics in the past 3 months. Even though TFF3 has been detected in the saliva and oral tissues and various literature does exist on TFF3 pertaining to OM, recent research has evidenced altered levels of salivary TFF3 in chronic periodontitis patients, thereby indicating its role in the pathogenesis of periodontal disease. It can also serve as a better indicator for periodontal disease. All the participants underwent baseline periodontal examination which was repeated 6 weeks later following scaling and root planning (where it was necessary) in the periodontitis group and only scaling in the gingivitis group. All the examinations were performed strictly according to the guidelines provided. Probing pocket depth and CAL were recorded using UNC-15 probe to the nearest millimeter. Errors during recording were kept to a minimum by a constant intraexaminer recording comparisons. All participants were instructed to refrain from eating and drinking 1 h before saliva collection. The patients were then asked to thoroughly rinse their mouth with water and then expectorate unstimulated whole saliva sample into ultraviolet sterilized cups. About 3–5 ml of saliva sample was collected and immediately transferred to an autoclaved 10 ml test tube, labeled, and transferred to a portable freezer before centrifugation. The collected samples were centrifuged at 2300 rpm for a time limit of 10 min, and then the supernatants were stored at a temperature of −20°C, until they were evaluated. The enzyme-linked immunosorbent assay (ELISA) protocol followed in the present study was the same as established by Samson et al. in their study. The TFF3 ELISA was based on two rabbit monoclonal antibodies. Recombinant human TFF 3 was used for calibration wherein salivary supernatants were vortexed and diluted with the assay buffer. Before the assay further dilutions were performed to check if the dilutions were too low or too high to estimate the TFF3 concentration. Recombinant human TFF3 peptide was diluted in assay buffer to the concentrations of 0.0003–0.183 nmol/dl. (a) Comparison of the two groups with respect to trefoil factor levels was assessed using Mann–Whitney U-test with a P = 0.05. (b) Correlation between the clinical parameters and trefoil factor 3 was determined by Spearman's rank correlation method. A level of significance of 5% was assumed (P < 0.05). Statistical software: The statistical software namely : SPSS 20.0, Stata 8.0, MedCalc 9.0.1, and Systat 12.0, (IBM, United States). were used for analysis of the data. Demographic characteristics and periodontal characteristics and of the study participants are shown in [Table 1]. The gingivitis patients were comparatively younger and showed a female predominance compared to the chronic periodontitis group. All the gingivitis patients demonstrated normal periodontium (PD <4 mm and CAL <3 mm). However, as bleeding on probing (BOP) is a cardinal sign of gingivitis, >5% of sites that evidenced BOP were included in the gingivitis group. Nineteen patients with CP were diagnosed with localized CP (≤30% of sites with PD ≥5 mm and CAL ≥3 mm) and six cases as generalized CP (30% of sites with PD ≥5 mm and CAL ≥3 mm). The study participants who had periodontitis and gingivitis were clinically evaluated at baseline and 6 weeks after initial periodontal therapy which included scaling and root planing as required. [Table 2] shows the mean BOP, PI, and GI scores significantly improved in both the groups from baseline. The mean decrease in PD in the periodontitis group was from a baseline value of 3.85 ± 0.66 mm to 2.96 ± 0.35 mm at 6 weeks after initial periodontal therapy and the improvement in the CAL from a baseline mean value of 4.46 ± 1.03 mm to 3.18 ± 0.64 mm at 6 weeks after initial periodontal therapy. These data demonstrate that initial periodontal therapy improved the clinical measures in the periodontitis group and gingivitis group showing a shift toward periodontal health [Table 2]. The mean levels of trefoil factor-3 at baseline were 2.21 ± 0.63 nmol/dl in the periodontitis group and 1.60 ± 0.64 nmol/dl in the gingivitis group. Following the treatment at 6th week, the values turned out to be 2.47 ± 0.73 nmol/g in periodontitis group and 1.76 ± 0.51 nmol/g in gingivitis group. P value in the periodontitis group was: 0.0278* (P value <0.05) which indicates a significant difference in TFF 3 concentration from baseline to 6 weeks after intial periodontal therapy. P value in the gingivitis group is: 0.3229 (P value >0.05) Hence no significant difference is found in TFF3 concentrations from baseline to after initial periodontal therapy. The difference was found to be moderately significant between the groups [Table 3]. The TFF3 levels and PI showed a positive correlation. There was negative correlation found between TFF3 levels and the other periodontal parameters, namely, GI, PD, and CAL in both the groups. 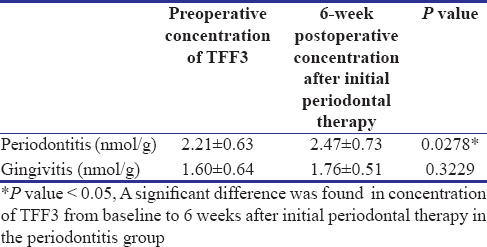 Six of the 25 chronic periodontitis patients required periodontal surgery at the completion of the study, this correlating with their high TFF3 values which were not altered at 6-week reevaluation [Table 4] and [Table 5]. To the best of our knowledge, the present study is one of the two studies investigating the role of trefoil factor 3 in chronic periodontitis patients and also the first study to investigate the levels of TFF3 before and after nonsurgical therapeutic intervention in both periodontitis and gingivitis patients. The periodontitis patients' group consisted of moderate and severe periodontitis patients and hence it can serve as a better indicator for TFF3 levels. Among the three trefoil factors, TFF3 had been selected for the present study as the other two factors TFF1 and TFF2 were found to have no significant effect on the oral keratinocytes. Samson et al. have found that TFF1 and TFF2 concentrations in the gingival tissues showed no significant alterations in periodontally healthy participants. Hence, TFF3 levels had been evaluated in the periodontitis and gingivitis groups in the present study. Most of the studies involving biomarkers usually are case–control studies where the titer of the particular marker is compared between gingivitis individuals and those who have established periodontitis of varying severity. In this study, however, patients with moderate-to-severe periodontitis were compared with those who have chronic gingivitis and were otherwise perfectly healthy. The rationale behind this decision was that the transition from gingivitis to periodontitis is an important phase in periodontal pathogenesis and it is important to distinguish between established gingivitis and early periodontitis. Further many patients having moderate-to-severe periodontitis posed the need for periodontal surgery on the first visit as well as following the Phase I therapy. Often, the decision to perform surgery is an arbitrary one depending mainly on the judgment of the clinician. If the clinician has a reasonable idea about the response of the tissues, then he/she can make a correct decision whether the patient requires periodontal surgery or can be managed by nonsurgical therapy alone. The finding of this study wherein six of the 25 periodontitis patients who required surgery had variable trefoil factor 3 and might prove to be significant. The reason behind this was because of the patients not responding well for NSPT and who showed consistent probing pocket depths. This study is the first of its kind which investigated the role of TFF3 in chronic periodontitis with nonsurgical periodontal therapeutic intervention. Only a few studies have been performed till date on the secreted trefoil peptides and most of the studies have used semi-quantitative methods to show the presence of one or the other trefoil peptides in saliva, cervical mucus, gastric juice, or pancreatic fluid. Saliva offers many benefits over gingival crevicular fluid in its easy and noninvasive way of collection which is under the control of the clinician and its availability in adequate amounts. Hence, saliva was preferred as the diagnostic tool for TFF3 analysis. Similar to earlier study, the whole mouth unstimulated saliva samples which are a representative of both salivary and gingival crevicular fluid secretions were collected and stored until further analysis was carried out by ELISA. A study was conducted to validate ELISA assays for the measurement of trefoil peptides in secretions and to determine the concentrations of trefoil peptides in mixed saliva and in cyclical cervical mucus in healthy adults. Saliva from healthy individuals and cervical mucus as well as blood collected three times during the menstrual cycle from healthy women were analyzed. The samples were analyzed by ELISA in which TFF1 was based on two polyclonal rabbit antibodies, TFF2 on a monoclonal mouse antibody and a polyclonal rabbit antibody, and TFF3 on two polyclonal rabbit antibodies. Authors concluded that quantitative measurements of trefoil peptides in viscous secretions were feasible using previously established ELISA methods. In addition, it was evidenced that saliva and cervical mucus contained large amounts of TFF3, wherein cervical mucus showed cyclic changes with a decrease in concentrations after ovulation. Authors also suggested that the results paved the roads for further studies of the trefoil peptides in saliva and cervical mucus under various physiological or pathological conditions. The same ELISA protocol which had been validated in the above study done by Samson et al. had been employed in the present study to evaluate the salivary concentrations of TFF3 in chronic periodontitis and gingivitis patients. The age of the participants in the present study ranged from 25 years to 60 years and the mean age being 40.6 years for the periodontitis group and 30.8 years for the gingivitis group. This is understandable as more and more people are affected by chronic periodontitis as they grew older. It is difficult to find patients beyond 40 years without periodontal attachment loss at least in a few teeth of their dentition. The periodontal parameters had improved at 6-week reevaluation in both the groups. 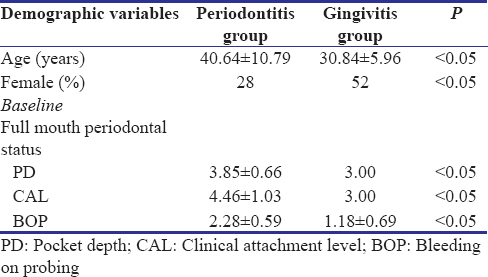 All the periodontitis patients in the periodontitis group had a mean PD of 3.85 mm and a mean clinical attachment loss of 4.46 mm, whereas the gingivitis group exhibited no evidence of periodontitis at baseline. The TFF3 levels and PI showed a positive correlation. A negative correlation was found between TFF3 levels and the other periodontal parameters. These findings were similar to those found in the study done by Chaiyarit et al. where none of the periodontal parameters were correlated with salivary trefoil factor 3 concentrations. The possible limitations of the study were: as complete protein analysis was not carried out for the saliva samples, the change in TFF3 levels could not be ascribed to the total salivary protein concentrations, and manual probing was done to evaluate the PDs and attachment levels, and even though it was done with a UNC-15 probe which is a third generation periodontal probe would have been more efficient in determining the minor changes in the calibrations. There were variations in TFF3 concentrations in the periodontitis group, suggesting that TFF3 might have a role in periodontal therapy. However, this moderate change cannot be taken at face value and requires further evaluation in long-term clinical trials with larger sample size. The presence of varying correlations between TFF3 and periodontal parameters suggests that further investigations in larger populations are required to establish a possible correlation. As this study was not only one of the two studies to investigate the role of TFF3 in chronic gingivitis and chronic periodontitis patients, it was also the first of its kind to investigate the TFF3 levels before and after nonsurgical therapeutic interventions in both gingivitis and periodontitis patients. As this relation appears to be significant, further research is necessary to establish a definite relation which may necessitate the collection of histological samples in those patients requiring periodontal surgery and trefoil factor 3 can also be studied using immunohistochemistry. We heartily thank the Department of Oral Pathology, Vishnu Dental College, Bhimavaram, for their continuous support of our study. Samson MH, Chaiyarit P, Nortvig H, Vestergaard EM, Ernst E, Nexo E, et al. Trefoil factor family peptides in human saliva and cyclical cervical mucus. Method evaluation and results on healthy individuals. Clin Chem Lab Med 2011;49:861-8. Jagla W, Wiede A, Hinz M, Dietzmann K, Gülicher D, Gerlach KL, et al. Secretion of TFF-peptides by human salivary glands. Cell Tissue Res 1999;298:161-6. Kouznetsova I, Gerlach KL, Zahl C, Hoffmann W. Expression analysis of human salivary glands by laser microdissection: Differences between submandibular and labial glands. Cell Physiol Biochem 2010;26:375-82. Verey F, Nexo E, Greenwood R, Berry M, Corfield AP. Trefoil factor family peptides are increased in the saliva of children with mucositis. Clin Chem Lab Med 2011;49:2051-5. Tebbutt NC, Giraud AS, Inglese M, Jenkins B, Waring P, Clay FJ, et al. Reciprocal regulation of gastrointestinal homeostasis by SHP2 and STAT-mediated trefoil gene activation in gp130 mutant mice. Nat Med 2002;8:1089-97. Cook GA, Familari M, Thim L, Giraud AS. The trefoil peptides TFF2 and TFF3 are expressed in rat lymphoid tissues and participate in the immune response. FEBS Lett 1999;456:155-9. Chaiyarit P, Chayasadom A, Wara-Aswapati N, Hormdee D, Sittisomwong S, Nakaresisoon S, et al. Trefoil factors in saliva and gingival tissues of patients with chronic periodontitis. J Periodontol 2012;83:1129-38. Mori K, Fujii R, Kida N, Takahashi H, Ohkubo S, Fujino M, et al. Complete primary structure of the human estrogen-responsive gene (pS2) product. J Biochem 1990;107:73-6. Tomasetto C, Rio MC, Gautier C, Wolf C, Hareuveni M, Chambon P, et al. HSP, the domain-duplicated homolog of pS2 protein, is co-expressed with pS2 in stomach but not in breast carcinoma. EMBO J 1990;9:407-14. Hauser F, Poulsom R, Chinery R, Rogers LA, Hanby AM, Wright NA, et al. HP1.B, a human P-domain peptide homologous with rat intestinal trefoil factor, is expressed also in the ulcer-associated cell lineage and the uterus. Proc Natl Acad Sci U S A 1993;90:6961-5. Wong WM, Poulsom R, Wright NA. Trefoil peptides. Gut 1999;44:890-5. Vocka M, Langer D, Petrtyl J, Vockova P, Hanus T, Kalousova M, et al. Trefoil factor family (TFF) proteins as potential serum biomarkers in patients with metastatic colorectal cancer. Neoplasma 2015;62:470-7. Vestergaard EM, Brynskov J, Ejskjaer K, Clausen JT, Thim L, Nexø E, et al. Immunoassays of human trefoil factors 1 and 2: Measured on serum from patients with inflammatory bowel disease. Scand J Clin Lab Invest 2004;64:146-56. Kinoshita K, Taupin DR, Itoh H, Podolsky DK. Distinct pathways of cell migration and antiapoptotic response to epithelial injury: Structure-function analysis of human intestinal trefoil factor. Mol Cell Biol 2000;20:4680-90. Shi L, Zhou PH, Xi JL, Yu HG, Zhang BH. Recombinant human trefoil factor 3 ameliorates bowel injury: Its anti-inflammatory effect on experimental necrotizing enterocolitis. Int J Pept 2014;2014:634135. Rösler S, Haase T, Claassen H, Schulze U, Schicht M, Riemann D, et al. Trefoil factor 3 is induced during degenerative and inflammatory joint disease, activates matrix metalloproteinases, and enhances apoptosis of articular cartilage chondrocytes. Arthritis Rheum 2010;62:815-25. Barrera GJ, Sanchez G, Gonzalez JE. Trefoil factor 3 isolated from human breast milk downregulates cytokines (IL8 and IL6) and promotes human beta defensin (hBD2 and hBD4) expression in intestinal epithelial cells HT-29. Bosn J Basic Med Sci 2012;12:256-64. Storesund T, Schenck K, Osmundsen H, Røed A, Helgeland K, Kolltveit KM, et al. Signal transduction and gene transcription induced by TFF3 in oral keratinocytes. Eur J Oral Sci 2009;117:511-7. Qu Y, Yang Y, Ma D, Xiao W. Increased trefoil factor 3 levels in the serum of patients with three major histological subtypes of lung cancer. Oncol Rep 2012;27:1277-83. Giannobile WV, Beikler T, Kinney JS, Ramseier CA, Morelli T, Wong DT, et al. Saliva as a diagnostic tool for periodontal disease: Current state and future directions. Periodontol 2000 2009;50:52-64. Thim L, May FE. Structure of mammalian trefoil factors and functional insights. Cell Mol Life Sci 2005;62:2956-73. Thim L, Wöldike HF, Nielsen PF, Christensen M, Lynch-Devaney K, Podolsky DK, et al. Characterization of human and rat intestinal trefoil factor produced in yeast. Biochemistry 1995;34:4757-64. Thim L, Madsen F, Poulsen SS. Effect of trefoil factors on the viscoelastic properties of mucus gels. Eur J Clin Invest 2002;32:519-27. Mashimo H, Wu DC, Podolsky DK, Fishman MC. Impaired defense of intestinal mucosa in mice lacking intestinal trefoil factor. Science 1996;274:262-5. Poulsen SS, Kissow H, Hare K, Hartmann B, Thim L. Luminal and parenteral TFF2 and TFF3 dimer and monomer in two models of experimental colitis in the rat. Regul Pept 2005;126:163-71.